Picasso arrived in Paris too late to see the large Van Gogh exhibition mounted at the Galerie Bernheim-Jeune in the last two weeks of March 1901, but he must have seen the paintings owned by Vollard, who had organized a pioneering retrospective in January 1897 and was a major lender to the 1901 show. The enthusiasm felt by the younger generation for the daring of Van Gogh's works was whetted by sympathetic interest in the drama of his life, which became better known when extracts from his diaristic letters to his brother Theo began to appear shortly after his death. Van Gogh was much on the art world's collective mind at the turn of the century, and in reviewing Picasso's exhibition at Vollard's gallery Fagus included his name in the list of modern artists on whom he felt the young Spaniard was too dependent. The encrusted surfaces, intense prismatic colour, bold contours and patterned brushwork of a number of those pictures bear him out, but the painting which manifests Picasso's esteem most frankly is a small votive panel painted after the Vollard show had closed. The Death of Casagemas, imitates Van Gogh's Self Portrait with Grey Felt Hat and Van Gogh's Chair so closely that it is virtually a pastiche, and in this case Picasso had a pressing private agenda. The Death of Casaqemas is one of several memorials Picasso dedicated to the young painter who had shot himself in Paris on 17 February 1901 .The immediate cause of the suicide was Casagemas's failed love affair with Germaine Gargallo, whom he had met on his first visit to Paris in October 1900. She, it seems, was cheerfully promiscuous whereas he was impotent. Picasso was in Madrid at the time of the disaster and it was only after the pressure to produce for his exhibition had lifted that he began to deal with it in his work. The fact that he moved into the very studio on boulevard de Clichy Casagemas was renting at the time of his death intensified his obsession, and he must have chosen Van Gogh as the intermediary for the votive panel because he saw so many parallels between the two men's tragic lives and violent deaths. 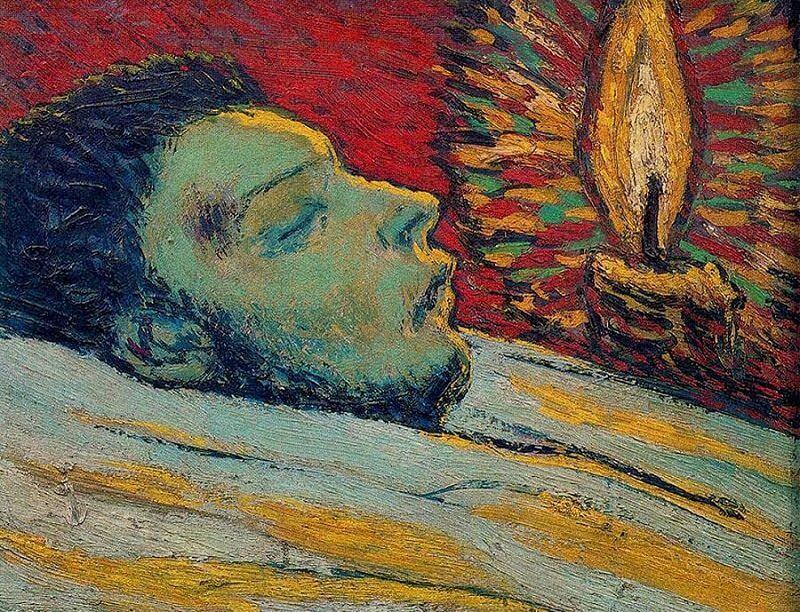 Possibly he had heard about, or even seen, Dr Gachet's touching little drawing of Van Gogh on his deathbed, for it too concentrates on the head, showing it from almost the same angle. By 1901 this notion of Van Gogh had become entrenched and it must have seemed to Picasso that a nervy, violent, 'expressionist' style based on Van Gogh's was most appropriate for a memorial to a painter driven to desperation by his sufferings. Simultaneously he was able to honour Casagemas by identifying him with Van Gogh.